Mercedes-Benz E63 AMG revealed | What Car? Mercedes-Benz has revealed its new range-topping E63 AMG. Powered by a 6208cc V8, the E63 AMG produces 518bhp, up 11bhp on the model it replaces, and 465lb ft of pulling power. However, efficiency-enhancing modifications result in a car that uses 12% less fuel than its predecessor. It now returns 22.4mpg. 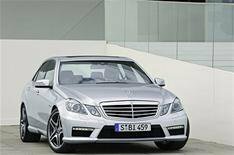 The new model retains the impressive performance of the previous E63, though, with a 0-62mph time of just 4.5 seconds and a top speed that is limited to 155mph. The new E63 gets the SL63's Speedshift MCT seven-speed gearbox with a wet start-up clutch. The new unit is lighter and more efficient, while giving better response. There transmission comes with four driving modes: Controlled Efficiency, Sport, Sport Plus and Manual. In Manual mode the system will change gear in just 100 milliseconds, while the Controlled Efficiency setting uses early upshifts and low revs to maximise fuel efficiency. Improvements to handling come in the form of a newly developed front and rear axle to give greater stability. New front spring struts improve responsiveness, while rear air struts ensure that the back is kept at the same height irrespective of the load. Visually, the E65 gets front wings that are 17mm wider than the standard E-Class's, 18-inch AMG alloys, LED daytime running lights, a new front spoiler, along with a rear diffuser and quad tailpipes. The E63 AMG will go on sale from September, but prices have yet to be confirmed.